There are vintage dance societies in cities and towns all around the US and indeed in Europe, too. 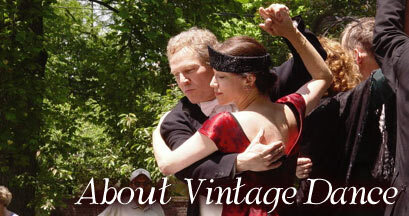 The term “vintage dance” was coined by Prof. Richard Powers, then at the University of Cincinnati, to refer to the social dances of the period from about 1840 to 1940. Vintage dancers seek to re-create not only the steps and patterns and style of these dances, but the music, costumes, manners and whole social milieu of the times. Vintage dance is living history. For more information and bookings, please visit our Contact Us page. The Regency Era (1800-1830) - English Country Dances, Scottish Jigs and Reels, French Quadrilles, and the early German Waltz. The Romantic Era (1840-1875) - Polka, Grande Waltz, Schottische, Mazurka, Waltz-Redowa, Polonaise and Quadrilles. The Late Victorian Period (1875-1905) - Variations on the romantic dances, plus the New Waltz, Cake Walk, and Two-step. The Ragtime Period (1910-1917) - One-step or Castle Walk, Tango, Foxtrot, Maxixe, and various Animal Dances. The Jazz Age (1920-1935) - Charleston, Blues, Foxtrot, Samba, and Lindy Hop. These dance styles are the roots of the modern ballroom dances like the foxtrot, slow waltz and Viennese waltz, as well as contemporary popular dances like swing and Argentine Tango. In addition, LVD sponsors classes and events by our affiliates in Argentine Tango, Scottish Country Dance, and other related areas.